You are here: Wild Yeast / Search for "drying a starter/"
If you’re moving across the country and want to take your sourdough starter with you, or want to mail some to a friend, or want to save a backup of a particularly well-loved starter as insurance against accidental loss, drying your starter can be the way to go. Drying a liquid starter is simple and fast, and reviving it to baking strength takes less time, and is easier, than starting a new one from scratch. Before drying your starter, make sure it is strong and vibrant. 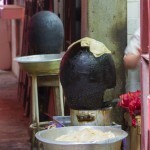 If you normally refrigerate it, take it out and feed it for a few days, as you would before using it in a dough. When it is good and strong, feed it a final time, then ferment it for about half the time you would normally go until the next feeding. You want the yeast to have something left to feed on while they are falling asleep. 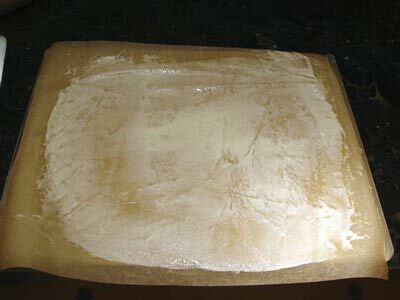 Then, using an offset spatula, spread a thin layer of starter on a piece of parchment, put it somewhere where it will be free from flying debris, and wait for it to dry completely. This will take approximately overnight, but the exact time will vary according to the hydration of your starter, how thickly your smear it, and the temperature and humidity in your house. Make sure it is completely bone dry, or you run the risk of mold. 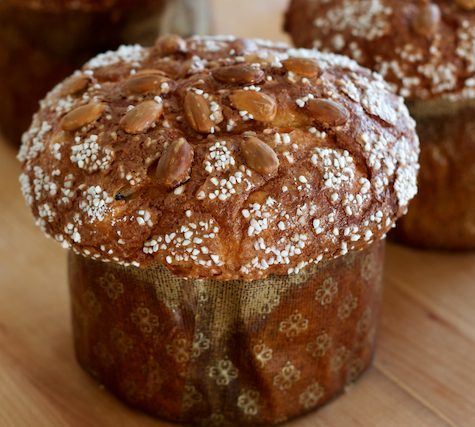 I started making panettone at Christmastime in 2006. Over these few years, I have tried variations on the recipe (here’s a chocolate one, and here’s one studded with bits of chocolate and ginger), but this is the one I keep coming back to. I still hold my breath each time I make it, because it’s fussy and needs to be pampered. But given patience, discipline, and a loving hand, it does not disappoint. Light and buttery, citrus-y sweet and holiday-special, its baking is a ritual that comforts and satisfies me. Sharing it with my family, and with you, makes me unreasonably happy. 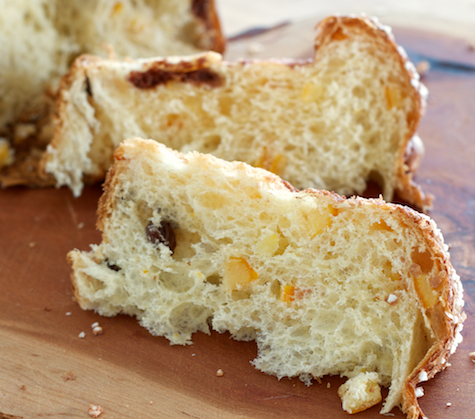 I first posted this panettone in 2007, and the recipe hasn’t changed. But I have accumulated a few refinements and lessons learned, so I thought it was time, once again, to tell you everything I know about making panettone. 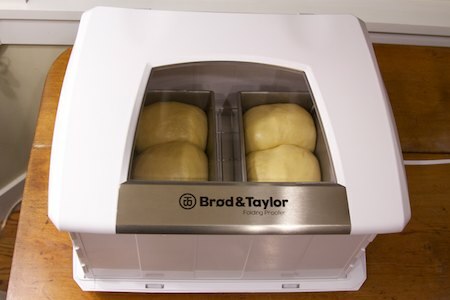 I’ll be honest: the Brød and Taylor Folding Proofer was not something I thought I particularly had to have. When I needed to keep my dough or starter snug and warm, I had been content with makeshift “proofing boxes”: the oven with the light on, the top of my stove under the range hood lights, or a big plastic bag with a frequently-changed bowl of warm water. But now that I have one, I’m over makeshift. The Brød and Taylor Folding Proofer is a tool that does one thing, does it well and without a fuss, and makes my baking life easier. It’s hard to ask for more than that from your equipment, isn’t it? 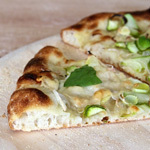 Plug it in, set the temperature, nestle your fermenting dough or proofing loaf inside its cozy incubator, and rest easy. Your dough will be well-cared-for at a consistent temperature, even if the temperature in your kitchen is not very bread-friendly. And constant temperatures make for more predictable proofing times. That’s good news if you’re a control freak, or if you just like your bread to turn out well. 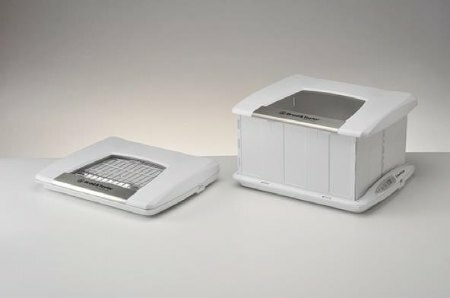 The proofer has a roomy, collapsible design. It has an 18 x 14.5-inch footprint and folds down to less than 3 inches thick for compact storage. The interior dimensions are 15 x 12.5 x 8.5 inches, which can accommodate a quarter-sheet pan, most 12-cup muffin pans, two or three loaf pans or oval brotforms, or two round brotforms of up to 8 inches in diameter. I can create a second layer for additional loaves by stacking two 12-inch square baking pans with Sklips. I do wish the proofer were just a skosh larger, to take a half-sheet pan (13 x 18 inches).